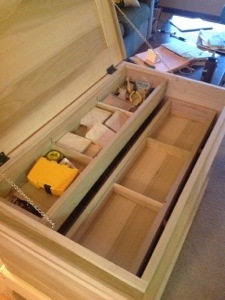 With the drawers in place and sliding freely, I began placing tools into the chest. Top drawer has marking and measuring tools along with my roll of chisels and block planes. The second drawer remains partially empty as I determine what I need at hand. The third holds my specialty planes and blades, router, fillister and rabbit. I have had them this way for the past couple of weeks and am well satisfied. The chest is a good height and I have access to all that I need. Best of all is the casters that allow me to roll it out of the way or close at hand depending upon my project. There are still several items to complete: knobs on the other tills, the lock and of course the finish. I intend to put finish on when the weather is consistently warmer and the other items as I get time. This was a great project and my hand skills have moved forward very rapidly. The first hand cut dovetails are in this project along with many hours of planed boards.My confidence has soared and I have a finished project that is proving very useful. The runners are glued into the chest. Clamping the drawers into my vice I reached for for my Stanley #4 Plane to begin fitting them. After a couple of passes across the dovetail pins I realized that the plane in my hand was in fact a #3. I acquired this plane several months ago and after flattening the sole and sharpening the blade it sat in my tool box. As the plane glides across the ends and sides, I test its weight and balance. The tote fits securely in my hand and as I begin and end a pass it lifts with my hands. The balance is extraordinary and I appreciate the slightly smaller size on the ends of the drawers. Admittedly I enjoy cleaning and working with different tools and I am fortunate to have a number of planes to use. Although differences can be subtle and planes can be used for a range of work, it is enjoyable when you find one that fits a task perfectly. After finishing and fitting the first drawer I continue to work on the nex t two, until they glide across the runners. I still have to insert plugs in the bottom grooves , but I will do this at a later time. I expect there to be more movement in the tool chest after I return it to the garage and will have to make some adjustments as the humidity rises in the summer. Finally all of the parts are made and I can begin assembling and gluing the interior of the chest.I don’t think the garage has been over 25 degrees for the past several weeks so there is little chance of glue being efffective. Therefore I moved the chest inside the house for a couple of days to allow it to warm and the lumber to move if it desires. The first step is installing the saw till. You can find details of how I assembled this on a prior blog. I cut four pieces of oak that will fit on each side of the till which will slide in between the pieces. I attached these to the side of the chest using hide glue and screws. Drilling small holes like these really makes my Miller Falls drill shine. In the back corner of the chest I installed an area to place the few moulding planes that I own. This was made fr two pieces of wood dovetailed together. Then I installed pieces of oak on each side of the ends to hold it in place. I installed two more supports in the corners for the drawer runners. These were also glued and screwed into place. Next came the bottom drawer runner which rests on two of the drawer supports. I debated back and forth on how to attach this runner and the two above. I even got great insight from John at woodworksbyjohn.blogspot.com. If you haven’t been to his blog yet give it a try. Based upon the thickness of the runners I decided that gluing them in would be best. A little hide glue and gentle persuasion with a rubber hammer and they fit into place. I set the drawers in temporarily, they will have to be planed to fit. drawer space. It did not take long to begin placing planes and blades into the deepest of the drawers. The drawers are approximately 30″ in length and 8 inches wide. They are longest at the top and shorten by 1/4″ each step down. This allows space for the runners. (this will become clearer when I get the runners in place and get some photos onto the blog). 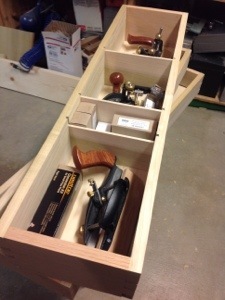 The first tools that need a new home are my rabbit plane, plow plane and router plane. I have quite a number of blades with these planes and wish to keep them together and close at hand. They are too tall to fit into the top two drawers, so I tried them in the third. They fit nicely but I quickly realized that adding dividers to this drawer would help keep the tools organized and the various blades with its tool. This is why I waited to glue up the drawers allowing me the option of making changes. Looking around the garage I found pieces of 1/2″ poplar left over from the drawer sides. I set up my planer and planed them down to 1/4″. The plow plane has the most components so I decided to place a divider for each plane and make an area to store the plow plane accessories. I disassembled the drawers and using my 1/4″ dado blade placed slots in in of the drawer sides. I reassembled the drawers dropped the dividers in place and ‘whammo’ nicely divided drawers. The drawer bottoms are straight forward. After milling poplar boards down to 1/2″ I glued them up to the required width. I was a little sloppy with the glue so it took a little time to clean up, then finish plane with my #4 smoother. Since I decided to deviate from Chris Schwarz’s plan to nail the bottoms to the sides, I needed to rabbit the edges to match the 1/4″ groove. I used my Veritas Rabbit Plane (moving fillister). I find this plane a little finicky to set up, but once I have the blade at 90 degrees it works wonderfully. The shavings come off in a nice twist. A nice component on this plane is the nicker which makes cutting across the board neat and clean. I considered doing this part on the table saw with dado blade,s but after I had the plane set it went so quickly, I did it by hand. Tomorrow I will look at the fit of my tools in the drawers, then glue them together. Looking around the garage it appears that I now have all of the components to finish the Tool Chest. Time to start thinking about the next project! My wife’s heater appeared in the garage this morning so I put it to work. With a little extra heat I was able to finish cutting the dovetails for the last drawer. Next I planed stock for the bottoms down to 1/2″ and prepared to cut a groove into the drawer sides. 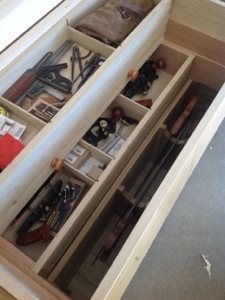 In the Anarchist Toolchest the drawer bottoms are nailed to the bottom of the drawers. This appears to have been done for ease of installation and to enable replacement of the bottoms should they wear. Since I used Oak on the sides of the drawers where they contact the runners, I don’t think wear will be an issue. I much prefer to place the drawer bottom in a groove. If you have been reading my blog you are probably think yeah, yeah, yeah it’s just an excuse to use the plow plane, and you are correct. The small veritas plow plane has become my favorite tool. I like the feel of the wood curling up over my fingers and the sound it makes cutting a groove. I set the plane up to cut a 1/4″ grove a little over a quarter inch from the edge of the board. Cutting the sides went well and I cut the groove through the end of the board knowing that the small groove will be hidden by the drawer runners and that if I desire I can place a plug into the groove. Using my gramercy holdfasts it was quick work. When I set up to groove the drawer sides I realized that the short length was going to pose a problem with holding the boards in place. The holdfasts did not prevent the sides from twisting away from the plane. The ends of the drawers required a different holding plan. 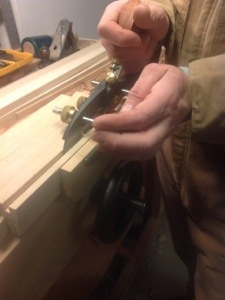 Placing one of my clamps in my Moxon vice I was able to secure the side and allow plenty of room for the guide of my plow plane to pass over the vice. I placed a spare piece of wood under the drawer side and plowed the groove. Once all of the groves were cut I will trim the bottom boards down to size and test fit them into the drawers. Two more to go and I’ll be ready for glue up. There have been several posts concerning the drawers in the tool chest. Many of them deal with the softer wood used in the chest to keep it as light as possible. Wear along the drawer bottoms appears to be the problem with many people advocating the use of a harder wood for the runners and glued to the bottom of the drawer sides. My chest has been made out of poplar because of the weight and lower cost so I have been considering my options and have come to the conclusion that it is already too heavy to manhandle and I should use any wood that suits me! Now there’s a bold statement. In the end I will use oak for the runners and the sides of the drawers. This should place the harder wood at the wear points and keep the cheaper poplar along sides. The first step is cutting all of the runners and support. This must be done first so that the drawer measurement is accurate. I measured and cut apiece of Oak that is 1 1/4″ wide to support the bottom drawer and the runner fro the second drawer. 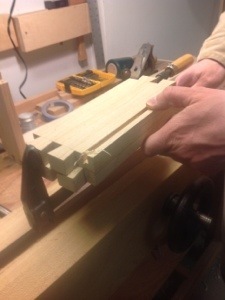 This runner is supported by the saw till guide and a support in the corner of the chest which is 1″ square oak. The next runner sits on top of this one and is the width of the chest. The top drawer will sit on this runner. 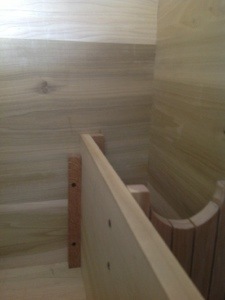 The photograph shows all of the runners and drawer slides in position. All of the drawers are dovetailed together. In the book Chris Schwarz nails the drawer bottoms on. I could not bring myself to do this. Since I used oak sides for the drawers I feel confident that the drawer wear will be under control. The botttoms are made of two pieces of popular 1/2″ thick with a 1/4″ rabbit around the sides. To control movement I will ship lap the boards. 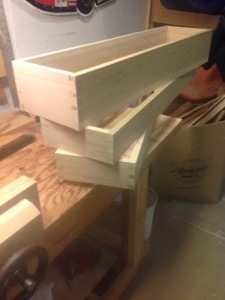 As of this post I have completed dovetailing two of the drawers before being driven out by the cold. My little heater managed to creep the temperature up to 30 degrees but it was not enough. I’ll have to wait for warmer weather, hopefully next weekend it will get into the low 40’s.